Are your waiters currently reciting a long list of beers when patrons ask what your bar offers? Do you have to spend time teaching every employee this list? More importantly, if your employees struggle to remember every beer you offer… how can your customers be expected to do the same? If so, you’re missing an awesome opportunity to make beer ordering simpler and quicker. 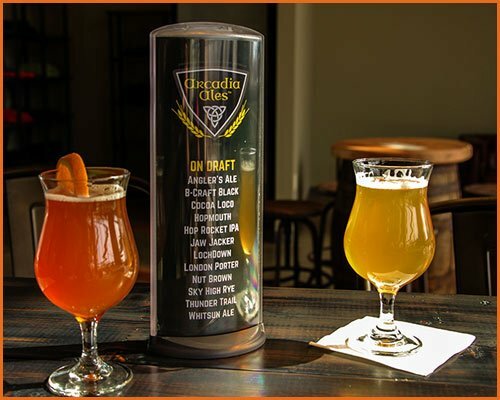 Podia Tabletop Menu Holders are becoming more and more popular with breweries, brewpubs, and bars. This popularity is, in large part, due to their durability, versatility and ease of use. By allowing you to swiftly change out beer specials, you can keep your tabletop displays constantly updated. And, even better, should your displays become dirty, they can be thrown into your dishwasher, cleaned up and returned to “like new” condition! With tabletop beer menus, your customers will always know what’s on tap. They’ll always be able to see your specials. More importantly, you can tailor every display to your customers’ needs. Are you constantly being asked if a beer is strong? Or what a certain brew tastes like? Add descriptions to your menu! Simply print out a new display insert – using a single 8.5” x 11” sheet of paper – and toss it into your Podia image capsule. It’s just that easy! At Podia, we aim to help restaurants, brewpubs, and other businesses streamline their tabletop – and countertop – displays. By allowing for rapid cleaning, instant display adjustments, and simple, no-hassle menu changes, we afford restaurants the ability to adapt and address the ever changing needs of their customers. If you’ve been looking for a novel way to make beer selection in your establishment easier, be sure to visit our shop and, of course, if you have any questions we encourage you to reach out to us!